Recently, I’ve written about the Chase Freedom card as a must-have credit card for all consumers who want to earn points to use toward travel. While there are other Chase products that one should consider using in tandem with the Freedom card, all consumers should carry at least one American Express card in their wallet. What makes this card so valuable and powerful is the combination of the Starpoints system and the backing of American Express. 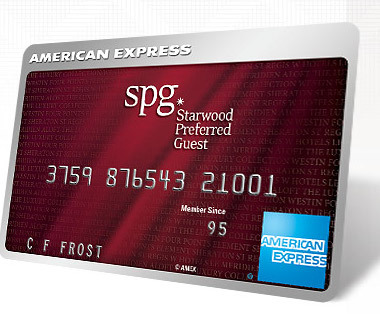 Starpoints are the proprietary points system for the Starwood hotel chain. Starwood hotels include Sheraton, Westin, the W, Le Meridien, Aloft, and a few others. Points can be used for free stays at the majority of these hotels (as well as nearly a dozen other ways to redeem points beyond just hotels), sometimes for as little as 2,000 points per night! That alone is impressive, but not enough to justify it being the “best” card for travelers or consumers. One of the amazing benefits of the Starpoints point system is the ability to transfer to ~30 major global airlines, and for every 20,000 Starpoints transferred within the same transaction, Starwood will automatically add another 5,000 Starpoints to the transaction! That’s a 25% mile bonus to the airline mileage program of your choosing! 20k Starpoints = 25k miles at American Airlines AAdvantage, British Airways Executive Club, Delta Air Lines SkyMiles, United Mileage Plus, and a few dozen others. Depending on how you use your points (and there are many ways to use them) Starpoints are conservatively worth at least 2 – 2.5 cents per point on the low end to over 5.5 cents per Starpoint on the higher end! (ThePointsGuy has an interesting analysis on how to maximize the value of your points for award hotel stays). Purchase Protection: When something you buy is broken or stolen, they can be protected from accidental damage or theft for up to 90 days from the moment you buy them. Coverage is limited up to $1,000 per occurrence, up to $50,000 per Cardmember account per calendar year. I have actually just used this feature this week on a pair of expensive shoes that were accidentally damaged. I receieved the full purchase price as a credit to my account. No hoops to jump through. Extended Warranty: The terms of the original manufacturer’s warranty can be matched up to one additional year, on warranties of five years or less that are eligible in the U.S. Coverage is up to the actual amount charged to your Card for the item up to a maximum of $10,000; not to exceed $50,000 per Cardmember account per calendar year. This means that a 6 month manufacturer’s warranty on a product is now a full year, a 1 year warranty becomes 2 years, and a 2 year warranty becomes 3 years, etc. I have used this featured multiple times, specifically on iPhones which often break/crack after the first year. While Apple covers the first year (on parts mainly), American Express covers year #2, leaving my device fully protected until I’m ready to sell and upgrade to the newest iPhone. Baggage Insurance: You can receive coverage against lost, stolen, or damaged carry-on and checked baggage when you purchase a plane, train, ship, helicopter, or bus ticket with your eligible card (only applicable on the SPG Business card, not Personal). For example, if you leave your jacket (with a digital camera inside the pocket) in the overhead compartment on the plane (which I did once), American Express will reimburse you for the value of the jacket + camera, assuming you used this card to purchase your flight. There are numerous other benefits including: Car Rental Loss and Damage Insurance, Global Assist, Roadside Assistance, and Travel Accident Insurance. Click here to read more on the Business SPG benefits or the Personal SPG benefits. Both the personal and business versions of this card are free for the first year and only $65 per year thereafter. If you take advantage of one of the benefits listed above, you’ve already made that fee back, and then some. If you are interested in learning more about this card or have any questions, feel free to tweet me at @YeahThatsKosher or comment below. Note: Do not apply for credit cards if you are in debt or if you have poor credit. We advise that all consumers only spend what they can afford to pay off in full each month to avoid paying interest fees and accruing debt.